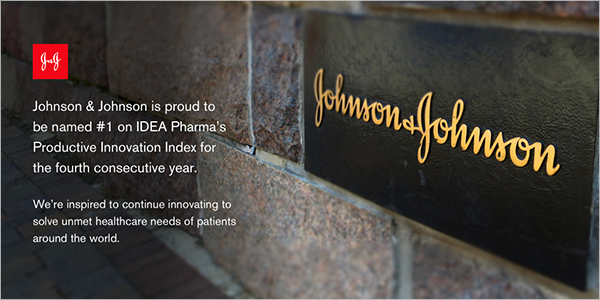 For the fourth consecutive year, IDEA Pharma, an industry-leading consultancy, has ranked Johnson & Johnson, the parent company of Janssen, as number one — among 30 pharmaceutical companies — in its sixth annual Productive Innovation Index. 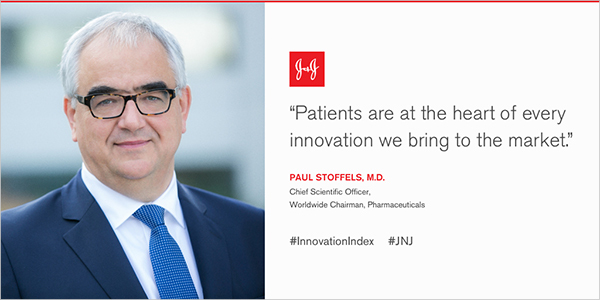 The Productive Innovation Index ranking is unique and especially significant because it not only measures a company’s ability to discover and develop solutions for patients, but also its ability to commercialise its innovations. Earning the top spot on the Productive Innovation Index validates our approach to innovation and collaboration. The Productive Innovation Index measures, scores and celebrates a company’s ability to deliver innovation to patients, by objectively evaluating performance data based on a rolling five year period (2010-2015), and operates on the premise: if you gave the same molecule to two different companies in early phase, which would make the best of it? Read a guest posting from Mike Rea, IDEA Pharma’s CEO, to learn more.